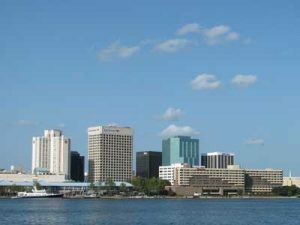 The 2018 Norfolk In-Water Boat Show will be held November 9-11 at Waterside in downtown Norfolk. Show hours are 12 noon – 5 pm on Friday and 10 am – 5 pm on Saturday and Sunday. The show will feature new and used power boats on land and in-water from dealers across the state and surrounding regions. On display will be a wide range of luxury motor yachts, sport fishing boats, personal water crafts, inflatables, and other vessels. Boats, equipment, and other displays will be located at the Waterside Marina, Town Point Park, and the newly opened Waterside District. The Norfolk In-Water Boat Show is returning to Norfolk based on interest from Hampton Roads boating industry leaders, according to Festevents CEO Karen Scherberger. The last year of the Norfolk In-Water Boat Show occurred in 2008 during the downturn of the economy. Norfolk Festevents, Ltd. will host the Norfolk In-Water Boat Show, the only major in-water boat show in the Hampton Roads region. For more information and to purchase tickets, visit: www.festevents.org.